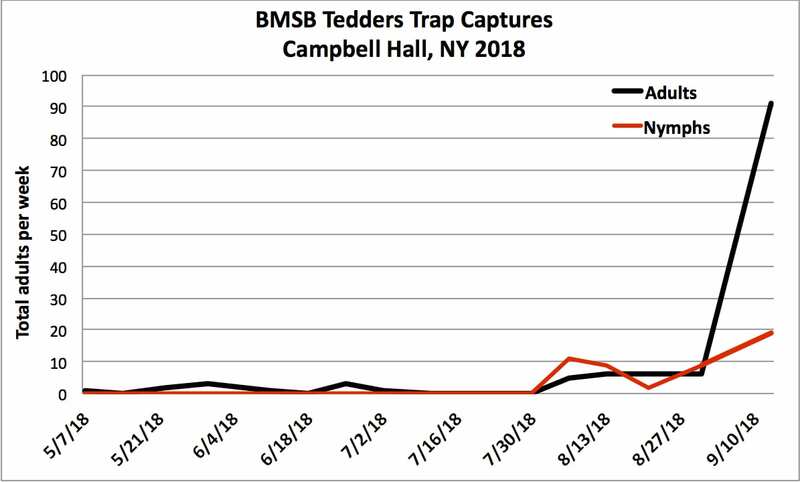 The 2nd generation of adult Brown Marmorated Stink Bug (BMSB) Halyomorpha halys (Stål) have been on the increase at the HVRL in Highland, NY this week. We are seeing the highest numbers at the lab trap site since 2012. Nymph numbers are declining as the populations mature to adults. 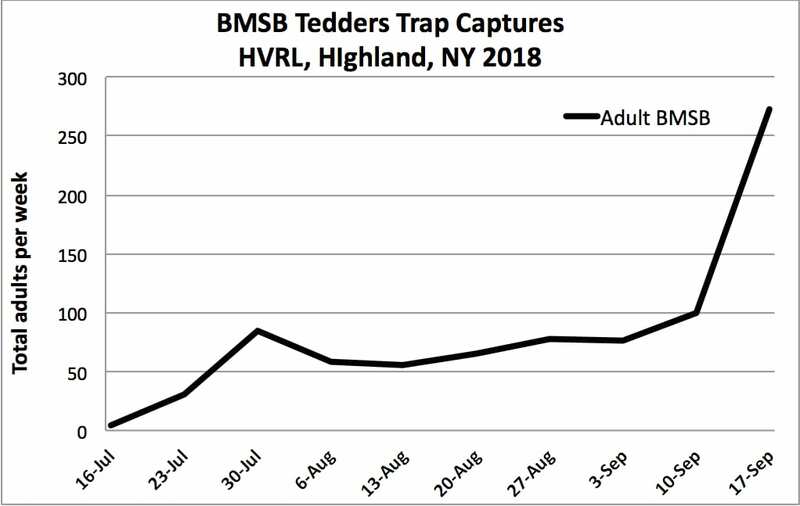 Traps have exceeded threshold in most of our sites where scouting and trap monitoring is conducted in a number of mid-Hudson Valley orchard sites. Considerable variability has been observed between trap types and trap locations. Identical Tedders traps ranging in BMSB numbers from 0 to over 50 within 30 yards of each other can be seen on any given day. BMSB will begin moving to apple as weather begins to dry over the next week. Empire, Red and Golden Delicious are at greatest risk this week along with second pick Honey Crisp. Early varieties harvested over the next few weeks will prompt the stink bug complex to funnel towards the remaining fruit in the orchard, especially if the temperatures remain warm during the evenings. Scouting combined with border row, alternate row and whole orchard applications should be strongly considered as movement of native and BMSB populations begin to migrate to orchards and feed to prepare for overwintering. The brown marmorated and native green stink bug are arboreal insects, residing in woodland habitat. However, when populations continue to rise through July into August, increasing numbers of adults and nymphs can be observed on tree fruit. This has occurred over the past few weeks. Increasing presence of the insects in trees will result in injury in remaining peach, pear and apple rows bordering woodlands and hedgerows. Nymphs ranging from 4th and 5th instar of both species can still be observed feeding on fruit along the orchard perimeter this week. The second generation has significantly increased BMSB population in woodland hosts. As host quality from the arborial woodland habitat declines, increasing migration to tree fruit is very likely through the end of August on through to the end of October. Increased scouting should be based on recent and upcoming Tedders trap captures. This will be especially important if weather turns dry with irrigated tree fruit becoming a favored host of BMSB as adults begin to feed more intensively as they prepare for their overwintering phase. Remember that trap captures combined with scouting for the various life stages of the insect along the orchard perimeter rows should be the basis for insecticide applications. 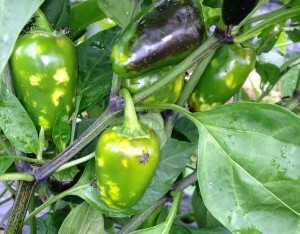 Unlike most other pests, we should not be using IPM thresholds based on stink bug feeding that results in fruit damage. As expression of the injury occurs 7-10 days or longer after feeding, you would have missed your opportunity to reduced injury if you postpone preventative applications while waiting on injury that has already occurred to become visible. Use a conservative presence and trap threshold on through harvest. Finding a single BMSB or green stink bug in the tree canopy within 100′ of scouted perimeter row would be considered a conservative threshold. Driving along the orchard will likely spook the insects. You’ll need to stealth your way quietly around the orchard…its good exercise in the early evening or morning. Green stink bug tend to remain low while BMSB tend to move to the tops of the trees to feed. When selecting insecticides for border row, alternate row and whole orchard applications you should consider constraints on your markets. If weather turns to drought, then longer residue based on the active ingredient minimum residue level (MRL) could become an issue, especially in EU markets and Israel. Review your options carefully with regards to harvest dates, PHI’s, re-application intervals and seasonal A.I. volume. .When BMSB populations dramatically increase during late season, migration into orchards can be dramatic. 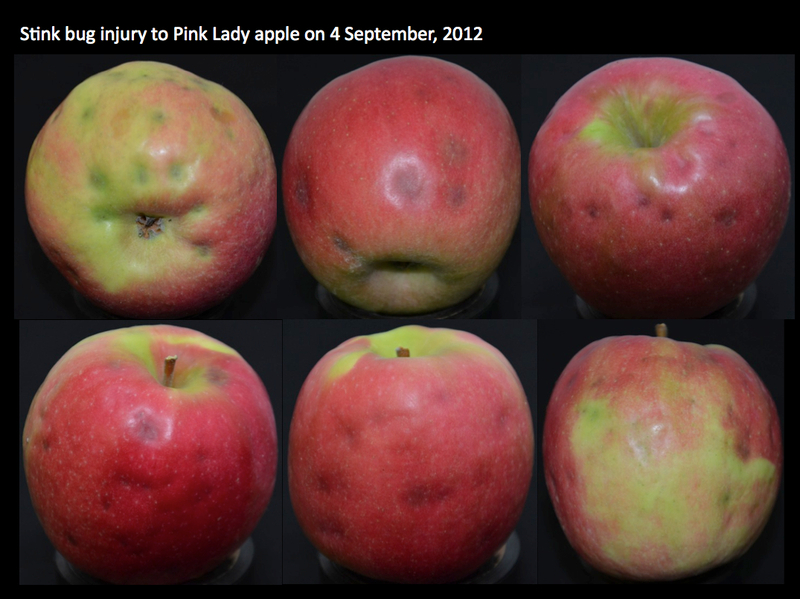 BMSB have been known to funnel down to the last variety standing (such as the high value Pink Lady). In which case applications in late October may be warranted!! 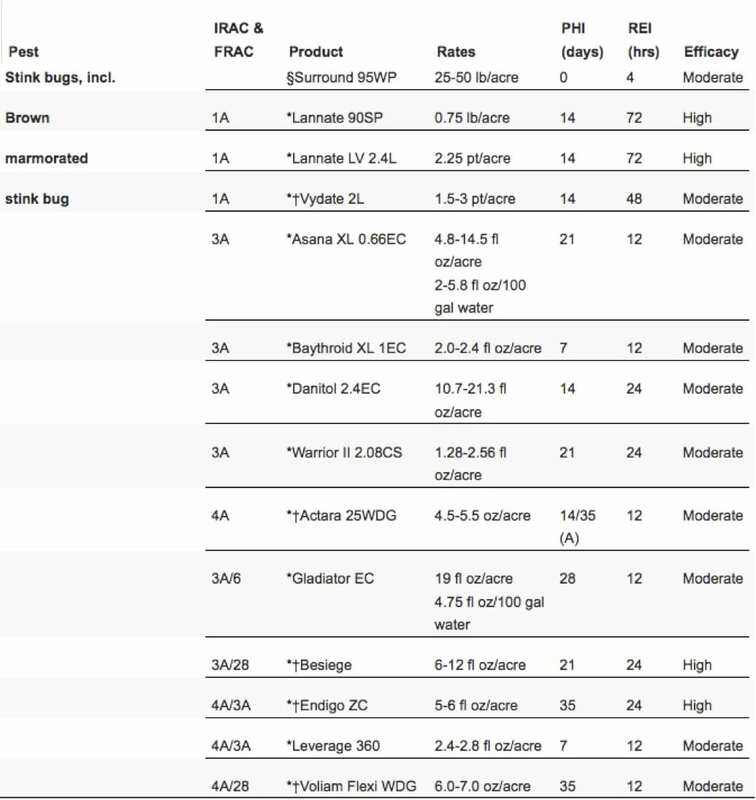 Applications of insecticides selected for whole orchard applications should also have strong efficacy for apple maggot and obliquebanded leafroller, which also require management this week. 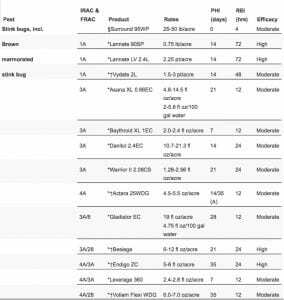 One of the most effective tools for use to manage BMSB is the active ingredient bifenthrin in a number of formulations. Bifenthrin has a 12 hr. re-entry interval, 14 day pre-harvest interval and a 30 day re-application interval. We received notice that the EPA has approved the Section 18 application for bifenthrin for use against the brown marmorated stink bug for 2018. Links below provide access to PDF copies of the Section 18 labels for materials containing the A.I. bifenthrin. Labels should be made available to the applicator during bifenthrin applications. These can be printed or available as digital files such as PDF’s on tablets or smart phones. We were able to add an additional 1000 acres for use in Monroe, Wayne, and Orleans Counties during the application process this year. The exemption is valid now through October 15th as a “Section 18 EXEMPTION, FOR DISTRIBUTION AND USE ONLY IN Columbia, Dutchess, Orange, Ulster, Monroe, Orleans, Wayne and Niagara Counties this year. Use in any other counties is prohibited. IN NEW YORK STATE”.